LEGO Fan and model car master builder Aliencat! shared this great pickup truck Custom 1952 Ford F1 in his flickr.com photo-stream. The car features an opening hood and doors as well as an engine and decorated interior. 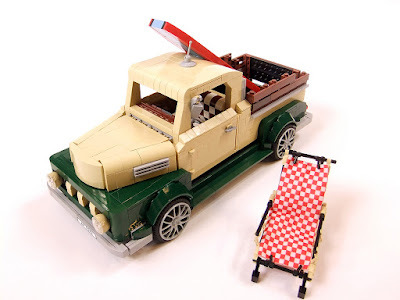 The creator also added a surfboard and a sunbed which make this MOC outstanding. This creation is built for the 100th LUGNuts challenge.